Despite the news about the Pan Am Games being over budget by $342 million, the media was swept up with the formal release of the 86-page climate change action plan ushered in by Premier Kathleen Wynne and Minister of the Environment and Climate Change, Glen Murray. When the big event occurred on Wednesday morning at the Toronto Brickworks, the weather failed to cooperate and the Premier arrived in a gas-guzzling SUV. She also ended the press conference early because “everyone is freezing”! Perhaps “Mother Nature” was demonstrating her frustration? Looking at the “Climate Change Action Plan” one finds a dazzling array of subsidies including: $14,000 towards the purchase of an electricity vehicle (EV), $1,000 for a charging station, a rebate to replace older cars, free electricity to charge your EV, money to replace your wood stove, pre-sale home energy audits, retrofits for apartments and social housing, money to install geothermal and heat pump systems for homes, rebates for people who build or own net-zero emission homes, money to offset the cost of climate change initiatives on residential and industrial electricity bills, money to help businesses switch to low-carbon technologies, money to increase walking and cycling, etc. etc. Curiosity got the best of me so I added up the costs of the planned incentives/subsidies (per the release); they came to over $8 billion, which is at the high end of the estimates announced by Minister Murray. Knowing the ability of the Ontario Liberal government to exceed their major spending plans, we should all be concerned with the potential cost overruns (61% for the Pan Am Games, according to the Auditor General). There is a caricature of utopia (seen through the eyes of the Ontario Liberal government) in 2050, depicting wind turbines, solar panels, green industry, sustainable agriculture, etc., surrounding Queens Park. In 2050, apparently, a river will run behind Queens Park — perhaps the glaciers melted? Anyone reading this plan would think Finance Minister Sousa suddenly found the estimated $5.9 to $8.3 billion to provide these subsidies in his back pocket, and Premier Wynne and Minister Murray are simply handing it back to the taxpayers of the Province. Not true! The annual cost to pay for these gifts will come from households who will, according to Minister Murray, pay $13.00 per month or $156.00 annually for all these benefits. Now, if Minister Murray does the math, the 4.9 million households in the province will have to cough up $760 million (via an additional tax on gasoline and natural gas heating) leaving a very large shortfall. One assumes the additional money will come from the suggested “cap and trade” revenue the government says will generate $1.8 to $1.9 billion paid by Ontario’s remaining carbon spewing industries. Incidentally, that is what California planned too, but they have just experienced a severe failure in an auction of carbon credits — it generated only 10% of the funds anticipated. Why should Ontario expect to do better? NB: The “Document Properties” indicate the PDF was created 6/8/2016 9.06:02AM and modified on 6/8/2016 9.06:47AM. Simply amazing! 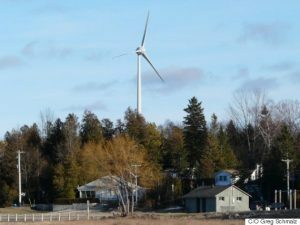 The opinions expressed here are those of the author and do not necessarily represent Wind Concerns Ontario policy. Again, thanks Parker for this enlightenment! What can be done to get these people to regain common sense?! 86 pages?! Cap and trade?! What nonsense is this? And why do they have to do what others do all the while stressing us out?! Not to mention bankrupting us. I am so very tired of it all. Earthjustice, San Francisco, CA, U.S.
We’ve built a society where people with degrees in politics or the arts, with very unrealistic ideas can gain positions of power and then presume to overrule engineers and financial analysts on their assessments. We have a political class who think politics rules everything and obstacles are somehow not real or can be dismissed. These people are arrogant in their certainty. They cling to their ideology and won’t listen to people who try to tell them why their ideas won’t work. They only listen to people who tell them what they want to hear. So the file was modified less than a minute after it was posted! …… Flying by the seat of their pants for sure!! Gotta love their happy little 2050 illustration. Meanwhile living in the real world what I see is many thousands of poorly sited, bird and bat annihilating, ineffective turbines, littering the landscape; tens of thousands of acres of otherwise green and growing landscapes covered with Chinese made silicon panels surrounded by barbed wire topped fence; hundreds of once pristine watersheds dammed for peak demand electricity; vast areas of forest foolishly turned into chips and agricultural land stripped of ever more of its carbon for the fools game called “bio-fuels”. Given the choice any sane and thoughtful person would prefer more public owned nuclear reactors, but that was just the foolish plan devised by some of N.A.s best engineers back in ’09 before the high school dropout Energy Minister Smitherman and his cabal of grifters and ideologues got their hands on the controls. Installing IWTs in the Great Lakes is NOT the same as installing them in ocean waters. The Great Lakes present a unique set of problems found nowhere else in the world for installing IWTs. Yet, offshore IWTs were included in the Green Energy Act. When issues arose with installing offshore IWTs, the government placed a moratorium on doing this, which they had a right to do. Who knows what this will now cost Canadian tax payers? The blame game is being played here. Smitherman was Minister when the Green Energy Act was enacted and testified on behalf of the offshore developer? Global Secretariat of Future Earth composed of five global hubs. Scroll down to: Feb.13, 2015 – Future Earth Organization.